The POV Dispatch is our Autodesk internal newsletter, published monthly, where we discuss the big ideas that are important to us and our customers. It is published by our Corporate Strategy & Engagement (CS&E) team of which Autodesk Labs is a part. Jon Pittman is the VP of CS&E, so it should come as no surprise that Jon routinely makes submissions to issues of the POV Dispatch; however, Bill O'Connor is a Corporate Strategist who provides the lion's share of the articles. Bill contributed this book review to a recent issue, and I thought I would share it with you. First of all, this is a book about "innovation" — and I usually hate books about innovation. (Note: And when I say it's about "innovation," I am basically using that word as synonymous with "creativity," as per the title of the book.) I am unabashedly biased against books on innovation, because almost all of them are terrible. 95% of them are I.B.N.U. : "Interesting But Not Useful"; and therefore, generally speaking, not worth your or my valuable time. Harumph. Second, I know the authors of this book. Well, one of them, anyway: Tom Kelley. I arranged for Tom to speak on main stage at Autodesk University in 2008 (he did a great job), and I've stayed in touch with him since then. To me, Tom, himself, is kind of the opposite of "books on innovation," in that his work is generally I.B.A.R.U. : "Interesting But Also Really Useful." So in the interest of total transparency, I began this reading/review process with a distinctly pro-Tom attitude. For me, this book review was a great example of the proverbial immovable object — innovation books are bad — meeting the irresistible force — but this one is by Tom Kelley... Conundrum! Which force would prevail? The Takeaway: So, Is This A Good Book? The short answer is: I think this is a very good book. Most people — and even some people who know a fair amount about innovation — will find much of this material either new, or at least a fresh presentation of things they need to be reminded about. One possible downside: For the innovation obsessed, some of the stuff near the front of the book about how "everyone can be innovative/creative," and "the power of innovation/creativity" might seem obvious, but it's my experience that we can all benefit from this particular pep talk, to keep our perspectives on this important topic fresh. 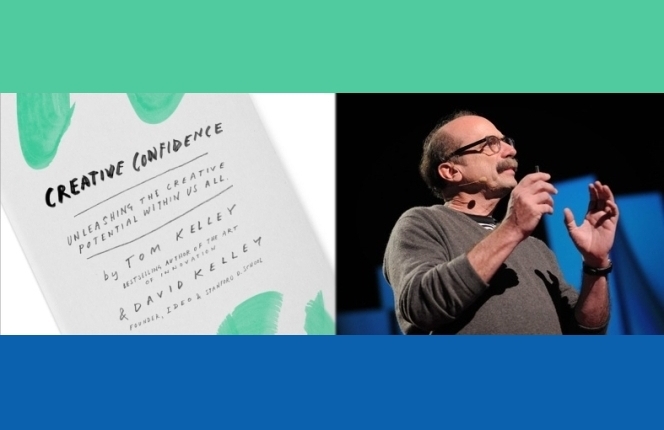 First, some background: as I started to say above, the authors are David Kelley — Founder of IDEO (one of the world's leading design firms, by many estimations) and creator of the Stanford d.school — and his brother Tom Kelley, a partner at IDEO, and author of The Art of Innovation and The Ten Faces of Innovation. They are both based in the San Francisco Bay Area; and IDEO has a global presence where they work with an exceptionally wide range of companies, organizations, and people on all manner of projects involving design, strategy, and yes, innovation. Hosannah of hosannahs, it's beautifully designed and fun to read. The illustrations are stylish ink drawings, the layout is clean, and the section where the authors are actually recommending that you do something specific are clearly delineated from the rest of the text. The writing style is brisk and energetic — very SF Bay area design firm meets inspirational professor-style — and the blend between ideas/concepts and real-world stories is just right. The Pulse founders, Ankit Gupta and Akshay Kothari, started the company as part of a d.school class, which meant they had only 10 weeks to get the whole thing up and running. The Kelleys consistently tout the value of constraints as a spur to fresh thinking, positive urgency, and innovation. As opposed to the "Let's Plan Everything Out First" mindset, these guys sat at a Palo Alto cafe, started creating the app, and started showing it to people in the café. Then they would tweak it — literally making dozens or even hundreds of tweaks every day — and show it to more people. In other words, prototyping and iteration — plus a constant stream of customer feedback. A key part of the "Do Something" mindset is the engaging-customers component. This is in keeping with the currently en vogue Lean/Agile approach to...well...just about everything — the idea that you envision something, make a version of it, show it to someone, and improve it, over and over again. There is great benefit in careful observation/understanding of the customer as opposed to just interacting with them when you show them your work. Taking an "open" approach to collaboration and creativity yields great benefits versus keeping everything behind closed doors. Again, for all of these principles, students and practitioners of innovation will have seen them and probably used them before, but the way in which they are presented and the stories that bring them to life add up to more than the sum of the conceptual parts. I would say that if you care about innovation/creativity, and want to keep expanding your understanding of it and your ability to do it, the book is well worth reading. P.S. If you don't have time to read the book yourself, you can check out the TED video. Confidence is alive in the lab.